Using best deck stain or sealer on your wood fence or decks is important factor in keeping healthy decks that will last for long. Finishes for a deck can either be stains or sealers. Sealers are actually clear and allow the natural wood color appearance while stains have a color. As unsealed wood an easily be deformed and damaged by mildew, bad weather, and other environmental factors like UV rays, it is important to routinely apply an appropriate seal on them. Choosing best deck stain or sealer is not easy because there are hundreds of brands out there. The right deck sealer depends on various factors that include but aren’t limited to the type of wood, location of deck and the extent of sun exposure. Generally, the more color the deck stain has, the more protection the deck has against UV light. The trade-off is colored deck stains need more cautious application because lap marks and uneven spots can easily form. 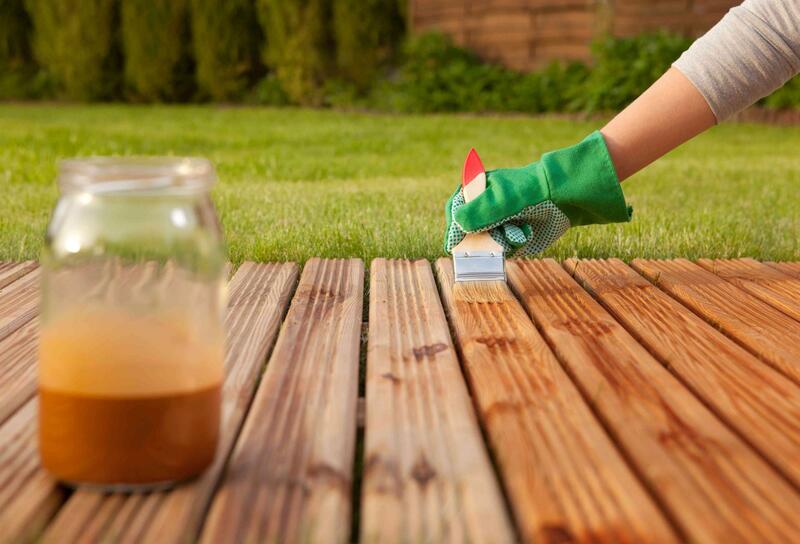 Additionally, deck stains can either be oil or water based. Water based sealers are quickly dried, easily cleaned and can easily applied in damp conditions. On the other hand, oil based sealers penetrate deeper, gives more deck protection and last for longer. If best wood stain is applied to the fence or deck, you will see that water beads up on the wood rather than soaking through. A deck which is properly will protect the wood because a protective layer covers it to prevent damaging elements from seeping through it. 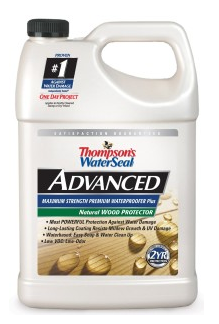 Thompsons Water Seal is best if you are looking for durable and convenient deck sealer. Its special water based formula protects against heavy mildew growth and UV damages that are top most reasons for deck damages. As it is water based sealer it dries quickly, easily cleaned, and is highly gentle to wood surfaces. While it doesn’t offer much protection as compared to oil based sealers, its application is much easier because it requires just a day and can be applied on both dry as well as damp wood. Just dump it on your deck with the help of paintbrush and then clean it with soap and water. It lasts 1 – 2 years but it is better to apply it after every year. Many individuals underestimate the easy application benefits of water based sealer and prefer an oil based sealer because of its deeper penetration and long lasting feature. However when they apply the oil based sealer, they get frustrated with a lot of time taking efforts and end up with several uneven spots. So if you don’t want to spoil yourself with a lot of work, simply go for water based sealer. Thompson’s cover around 200 square feet and it is best for home users. As it is the transparent solution it allow the natural beauty of your wood to appear. 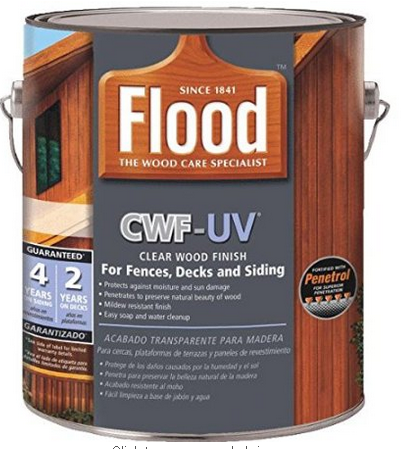 Flood Clear Wood is the best oil based deck sealer that last longer in harsh weather. It is a clear sealer that penetrates deeper into the pores and seals microscopic holes of wood to offer superior protection against UV light and mildew by penetrating. Because of this protective layer water and harmful elements cannot seep through the wood. When you apply it you will see that water drops will bead up on the deck instead of seeping into it. Damp wood is the beginning of the deterioration for your wood because it leads to deforming, cracking and expedited growth of mildew. Moreover, its UV protection is the best among all other products. Applying Flood CWF is much difficult and need extreme care get an even layer. Otherwise there are risks of creating lap spots and occasionally foot footprints even. It takes time to get dried and has a strong odor. The best part of using Flood CWF is that you will need less maintenance and you need to recoat it after every 2 to 3 years. This 5 gallon jug covers around 1000 square feet and it is compliant with VOC. However we strongly to suggest it those who have time and patience to apply it and if your deck is continuously exposed to harsh weather and ultraviolet light. 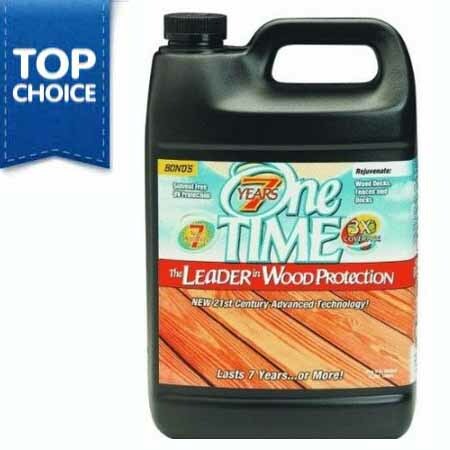 OneTime Wood Protector is best deck stain that is nether oil based nor water based. It is made from a resin acrylate that claims a whopping 7 years of protection as compared to 2 or 3 years protection by water and oil based sealers. It performs well against all types of harmful elements and UV light. We tested it by pouring water and we found the water beaded up and found no deformation. Remember this is a deck stain and it has pigmentation or color. We didn’t find any complains of discoloration when we reviewed OneTime across World Wide Web. Well for those who prefer a clear colorless solution, OneTime also offer colorless deck sealer. Superior UV protection is one of the exclusive advantage of using colored deck stain and therefore it is the suggested solution for decks that are exposed to light for long. When it is about application, OneTime is also not very much convenient. It need extreme care while you apply and clean up, otherwise you will see the lap spots and uneven coating. This product is only for those who have time as well as energy. Its odor is also quite harsh and you will find it tough to apply. However its payoff with long lasting durability is down the road. When we polled several long term users and ask for 7 years we found the average time to reapply it was 5 years, still longer than other sealers that offers 3 years at max. Are you someone who is looking for the best deck sealer, then you can consider the Ready seal 112 1 Galleon Can Natural Cedar exterior wood stain and sealer. This outstanding exterior wood stain and sealer offers a lot of advantage. 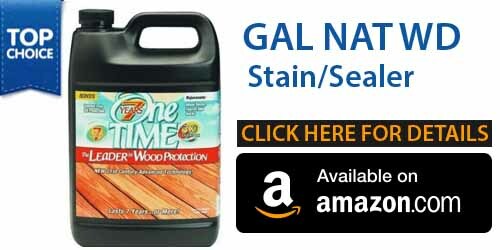 Ready seal 112 1 Galleon Can natural Cedar exterior wood stain and sealer doesn’t require the use of any type of primer. This exterior wood stain and sealer can be applied through various ways such as spraying, by using a roller or by using brush. When you use this exterior wood stain and sealer, it doesn’t require any type of back brushing or any wet line application. 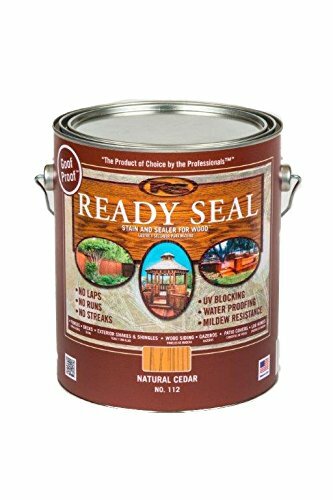 Also another benefit of using the Ready seal 112 1 Galleon Can Natural Cedar exterior wood stain and sealer is that it doesn’t require any specific temperature while applying and it can be applied at any range of temperature. It will enhance the natural beauty of the wooden surface and the stain is oil based two in one sealer and semi transparent seal and it can be used for any wooden exterior. It will also protect and also preserve the wooden exterior from mildew, mold or harmful UV rays. You can find different types of deck sealer in the market with different qualities. 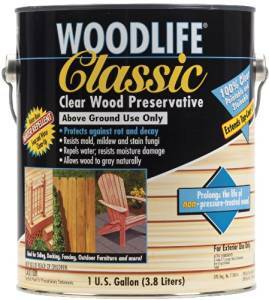 One great deck sealer for you is the Rust-Oleum 00903 Woodlife classic, 1-Galleon, Clear, that you can definitely take a look at. The main purpose for this item is to be used for painting the supplies, including the house hold wood stains. This deck sealer is a product of use. This product is also registered by the EPA and will provide effective solution as the fungicidal preservative. This fungicidal preservative will protect the surface that it is used on from the various surface molds, rot and decay and also mildew. It is also effective water repellant that will resist water damage of many kinds such as swelling, end-checking and also warping. Another property of this deck sealer is that it is 100% clear solution. You don’t need to worry at all about the discoloration of your original product. When you use this solution on the surface, it will easily reveal the natural wood colour and also it will allow the surface to turn gray through the natural process. You can easily use this product as either final finish or as a primer. What should you take a look at while purchasing a deck sealer? Always look for an oil base deck sealer which is mixed with latex as it is very easy to clean up. Check that the deck sealer has a clear finishing to it as it will allow the wood to turn gray through the natural process without any signs of damage such as splitting, cupping, warping or cracking. Consider purchasing a wooden toner as they are similar to the clear water repellant. Consider purchasing the semi transparent stains as they can provide better protection from the UV rays that can damage the wood and it will also offer better retention of the natural colour and extended life time.